The Washington Series 1358-1358-C Non-Rotating Diverter is ideal for use on Top Drive Rigs or Work Over Rigs where drill pipe is to be rotated inside stripper. Drilling oil & gas, water, monitor or geothermal wells, the 1358 bolt down style or the 1358-C clamp down style is a low profile diverter that is lightweight, compact and easy to install. Using air / water or mud as a circulating medium, it is a cost effective solution to safely diverting all drill cuttings away from the rig and personnel or into a container for disposal, keeping clean up cost to a minimum. 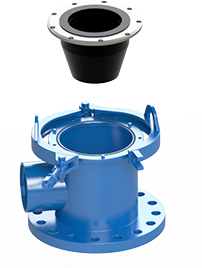 The diverter can be manufactured with any desired inlet or outlet flange, or can be manufactured to thread onto casing. To be used with 4010 Rubbers. Will handle from 2″ to 8″ drill pipe.